Copyright 2015 American Medical Association. All Rights Reserved. Applicable FARS/DFARS Restrictions Apply to Government Use. The pace of innovation has become a gauge for the health of national economies, individual businesses, and educational systems. It is a crucial gauge, too, for the health of the health care industry. Health care innovation has centuries of tradition, as far back as Galen, Vesalius, and the champions of the scientific method. It is now a vast field. In 2015, health care innovation comprises entire subindustries developing new drugs, diagnostic tests, therapeutic devices, prosthetics, information technologies, and more. In 2012, total estimated US medical and health research expenditures were about $130 billion, or just over 4.4% of total US health care expenditures.1 The vast majority of this investment is in biomedical and technological research and underlying basic sciences. From the viewpoint of health care delivery, however, aggravating shortfalls persist in health care innovation. First is the translational shortfall. Biomedical and biotechnical innovations can improve health only if they actually reach patients and communities, only if their value is accurately assessed, and only if choices about which innovations are used for whom and when reflect those assessments. This proper and prudent translation of innovations into practice is famously slow and deficient.2 Recent efforts have been mounted to speed up the process, such as the Bench-to-Bedside initiative of the National Institutes of Health,3 but how much they are helping, and at what cost, is not yet known. Second is a shortfall in focus. The bulk of innovations in health care have added cost, often with little proven benefit, to an industry reeling from outside and inside cost pressures. Whereas innovations in other industries have often steadily reduced costs to consumers while improving functionality (eg, laptop computers, cellphones, and web-based access to information), health care shifts more and more costs to consumers,4 takes an ever-increasing share of public and private budgets, and even flirts with rationing as allegedly inevitable. Under these circumstances, it could be expected, and hoped for, that a vast and authentic shift of innovation energies would occur toward changes that reduce costs while improving the outcomes and experiences of patients, families, and communities. No such shift is evident yet at anything near the scale needed. Third is a shortfall in the democratization of capacity. The millennial ethos and new information capabilities have combined through innovations to produce previously undreamed-of capacities for people to meet their own needs, with less intermediation of layers of supply. People use ATMs instead of bank tellers and queues, make travel reservations online instead of through travel agents, shop online instead of in stores, and use tax return software instead of accountants. Health care, in contrast, has clung more tightly to centralized, institutionally based, physically local, professionally controlled procedures and habits. For each of these shortfalls and others, examples are developing rapidly to fill the void, especially in local settings that are for one reason or another friendly to experimentation in health care delivery. But it is not like biotechnology, which, despite high levels of competition and corporate protection of intellectual property, has thriving systems and institutions for the exchange of ideas and growing knowledge. “Innovation incubators” are popping up in many cities, with sponsorship from venture capitalists, corporations, and philanthropists who are confident that such communities of endeavor will yield valuable new products and maybe nurture the next Bill Gates or Steve Jobs. Heath care delivery needs its “innovation incubators” every bit as much as biotechnology does. Fortunately, that idea seems to be gaining traction. For example, the Center for Medicare and Medicaid Innovation, funded under the Affordable Care Act at $10 billion over 10 years, is up and running and is projected to receive another $10 billion in 2019.5 The charge of the center is explicitly to foster the testing of new models of care and payment. The Agency for Healthcare Research and Quality curates a web-based Innovations Exchange with descriptions of more than 2000 delivery innovations and tools for improvement.6 The Robert Wood Johnson Foundation’s strong new focus on community health is energizing dozens of new projects. JAMA would like to contribute to this important discussion. Innovation and improvements in health care delivery require reliable access to mainstream journals to encourage innovators, subject their work to the refining effects of public discourse, and speed spread and adoption. In pursuit of those goals, JAMA is planning a yearlong series of articles on innovations in health care delivery to be published throughout 2016. Learning systems, especially identifying and adapting delivery models from other nations, and most especially finding and adopting lessons from developing nations. Articles on devices, information technologies, and other technologies that have effects on care delivery are welcome, as are reports on sociological, managerial, and organizational changes. One area not central to this initiative is innovation in health care payment and finance, which has numerous publication outlets. 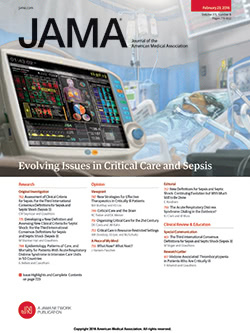 JAMA will focus on new ways in which care is organized and delivered, not paid for. In this series, JAMA is not seeking theoretical papers, but rather rigorous studies and systematic reports on outcomes based on innovations that have been developed and tested. Highest editorial consideration will be given to Original Investigations, ie, scientific reports that present new data on innovations that both reduce costs and improve care and outcomes. For Original Investigations involving patients, including survey studies and quality improvement initiatives, appropriate IRB review should be obtained. Evidence-based systematic reviews and scholarly Viewpoints on topics relevant to the clinical, implementation, entrepreneurial, and policy aspects of innovation in health care delivery also would be of interest. All submitted manuscripts will undergo editorial evaluation and if suitable, external peer review. High-quality manuscripts not accepted for publication in JAMA may (with the authors’ permission) be referred for further consideration by one of the JAMA Network journals. Authors should consult the JAMA Instructions for Authors7 for information regarding the preparation and submission of manuscripts. However, we realize that many people who create, test, and foster changes in care delivery may not ordinarily consider themselves to be potential JAMA authors, and some may lack familiarity with processes and skills for submitting manuscripts; therefore, authors are encouraged to contact us with any questions. Manuscripts may be submitted anytime after September 1, 2015, and throughout 2016. Achieving true innovation in health care delivery will require thinking beyond the status quo to envision, create, and discover new approaches to overcoming existing shortfalls in translation, focus, and capacity, and to truly achieve meaningful and sustained improvement and efficiency in health care delivery. With these priorities in mind, we look forward to receiving your manuscripts for the 2016 series on Innovations in Health Care Delivery. Editorials represent the opinions of the authors and JAMA and not those of the American Medical Association. Corresponding Author: Donald Berwick, MD, MPP, Editorial Affairs, Institute for Healthcare Improvement (IHI), 20 University Rd, Seventh Floor, Cambridge, MA 02138 (donberwick@gmail.com). Conflict of Interest Disclosures: All authors have completed and submitted the ICMJE Form for Disclosure of Potential Conflicts of Interest and none were reported. National Institutes of Health. Bench-to-Bedside Program. http://www.cc.nih.gov/ccc/btb/. Accessed July 21, 2015. Collins SR, Rasmussen PW, Doty MM, Beutel S. Too High a Price: Out-of-Pocket Health Care Costs in the United States. New York: Commonwealth Fund; 2014. http://www.commonwealthfund.org/publications/issue-briefs/2014/nov/out-of-pocket-health-care-costs. Agency for Health Care Research and Quality. https://innovations.ahrq.gov. JAMA Instructions for Authors. http://jama.jamanetwork.com/public/instructionsForAuthors.aspx. Updated July 8, 2015. Accessed July 21, 2015.